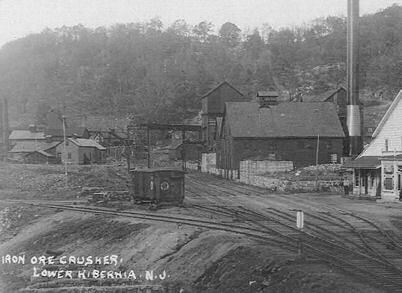 Iron ore is abundant in northern New Jersey, and iron interests have been active since the area's earliest history. 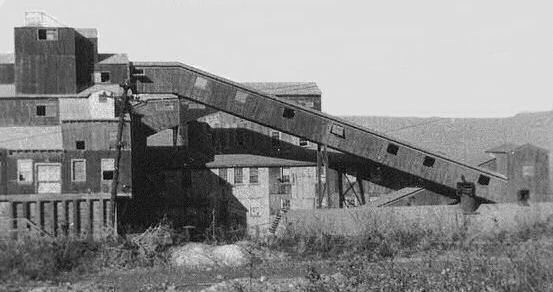 The Elizabeth Mine, one of a number of iron ore operations that comprised the Mount Hope Mine, owned by the Mount Hope Mining Company. 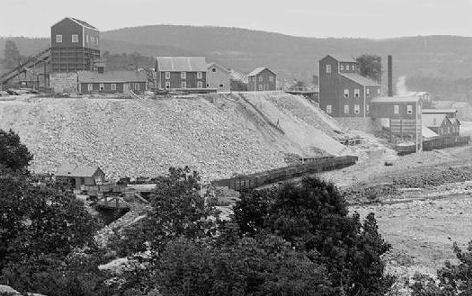 In 300 years of sporadic operation since 1710, the Mount Hope Mine produced about 6 million tons of iron ore and, from its forge and furnace, cast iron products such as Revolutionary War cannonballs. Much of the ore came from the Elizabeth Mine, which ran 1,120 feet deep. The 11 iron ore veins of the Mount Hope Mine outcropped jutted out from the ground. Aiming in a northeast direction, they dove deep into the earth. Mining started in open pits on the surface, then went underground with the ore vein. 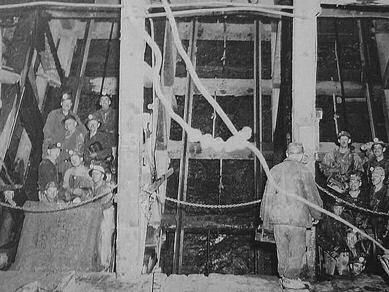 One of the sub-mines went down 2,740 feet!, the New Leonard Mine, put into operation during World War II. As far back as the early 1700s the name Andover was used by the Penns, owners of a large tract here granted to them by the Proprietors, to refer to the whole general area. Over the years, various sites have borne the Andover name, including local iron mines, forges, furnaces, factories and settlements with a connection with these early iron interests. "Old Andover" was the pre-Revolutionary War site later known as Waterloo village, about 5 miles south of our present-day town of Andover. Around 1763 the Loyalist iron company of Allen & Turner erected at Old Andover an iron furnace, forge, and refinery. Andover received its name from the birthplace of Mr. Turner, which was Andover County, Hampshire, England. The company mined its iron ore along a ridge a couple of miles north of where the town of Andover now lies. There they also built a furnace, grist-mill, blacksmith-shop, barn, dwellings, and a mansion for the superintendent of the iron works. The pig iron produced there was then sent to the Old Andover forge and refinery at Waterloo to be made into bars that were then transported on mules to the Delaware River for shipment or use elsewhere. The earliest non-aboriginal inhabitants of the present township of Andover were the iron-workers and miners brought here by Allen & Turner, probably a combination of slaves and indentured immigrants. 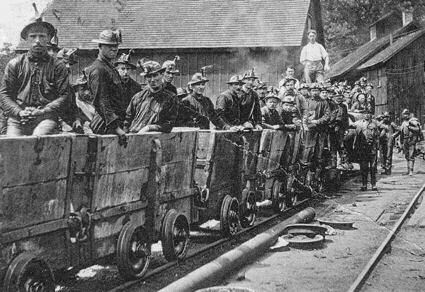 The Sussex Mine Railroad, chartered on March 9, 1848, was the predecessor of the Sussex Railroad that was to be used for the sole purpose of hauling iron ore from the Andover Mine. 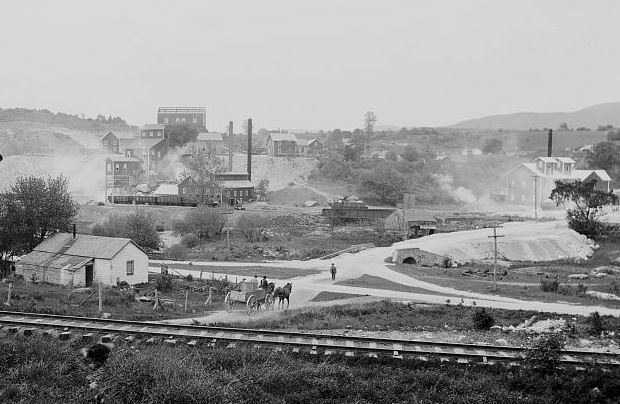 The narrow gauge railway was drawn by mules from the Andover Mine down to the Morris Canal at Waterloo Village and was then taken on to the Thomas Iron Furnaces in Allentown, Pennsylvania. The Act by the New Jersey Legislature that incorporated the railroad also allowed for the provision of extending the rail into Newton, the county seat. The Andover mine should not be confused with the Andover tunnel which is a major part of the mines at Hibernia in Morris County. The workings share the name because both were owned by the Andover Iron Company of Phillipsburg, New Jersey. Having been worked since before the Revolutionary War, the Andover mine is probably the original in this group. During the Civil War, Andover's high quality iron was made into steel for military firearms. The iron industry drastically changed the landscape throughout Northwest New Jersey. Most people assume that the land was cleared by farmers, but it was iron companies that did much of the original clearing for wood to be converted into charcoal fuel for blast furnaces. For the fuel demands of an active furnace, as much as an acre of wood a day was cut and used for charcoal production. Farmers later took advantage and established fields in which to grow their crops on the pre-cleared land. The Beach Glen Mine dates back to at least 1760 as this was the year a charcoal forge was built in the vicinity. However, it was not until 1808 that mining here was documented. At this time, minor surface mining took place and it was likely abandoned shortly after this date. 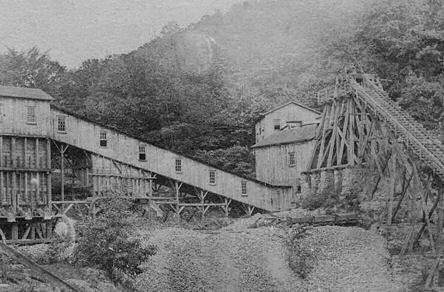 The mine was worked on and off from 1851 on when two openings were made 400 feet apart. In 1900, at a depth of 475 feet, a rich magnetite vein was discovered 14 feet wide yielding 56 to to 60 percent iron. Up to this point, only lean ore had been found. 7,000 tons of ore were removed but the plummeting price of ore closed the mine again in 1903. The mine reopened in 1923, working sporatically until 1930. The basis of New Jersey Zinc's business was a zinc-iron-manganese ore body formed by geological processes that took place over one billion years ago in the northwestern corner of the state. The area is unique, containing over 150 minerals, of which 25 are found nowhere else in the world. Moreover, the ore body became commercially viable through an accident of nature. Erosion exposed the deposits in the pre-Cambrian period, which were then covered by Paleozoic sediment and later eroded by glacial activity. The result was that deposits were readily visible to European settlers. By 1640, not long after the establishment of the Nieuw Amsterdam settlement, the natural outcrops had been discovered and were being explored. The Franklin mine passed through a number of owners, including King Charles II of England and William Penn and a group of investors. In 1760, the Earl of Stirling made failed attempts to extract zinc from the ore body, although he did produce iron, which would become a mainstay of the local economy late into the 1800s. A number of parties worked the Franklin-Sterling deposits from 1765 to 1848, but no one was able to successfully separate the zinc. 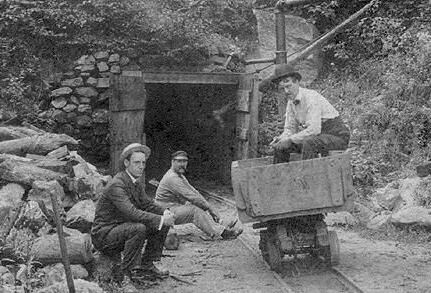 In 1848 the Sussex Zinc & Copper Mining & Manufacturing Company was formed. Four years later it developed the first commercially viable way to smelt the ore to produce zinc oxide. Also in that year, Sussex Zinc changed its name to the New Jersey Zinc Company. It began selling zinc oxide to the paint industry as a non-toxic substitute for lead, leading to the rise of ready-mixed paints. Zinc oxide also became an important compound in the rubber industry, not only serving as a reinforcing agent but as a way to cut the curing time of rubber. With the birth of the automobile and the need for tires and the increased need for other rubber goods, zinc oxide would take on an even greater significance. Starting in 1870, zinc oxide would also play an important role in the cosmetics industry. New Jersey Zinc also attempted to recover metallic zinc from the Franklin-Sterling deposits, but it wasn't until 1865 that the company was able to produce commercial slab zinc. Some ten years earlier, because of these efforts, the company had been able to create a second product, spiegeleisen (German for "mirror iron"), an iron-manganese alloy used in the manufacture of manganese steel. The company was not alone, however, in working the Franklin-Sterling outcrop, and conflicting deeds of ownership caused considerable legal wrangling. 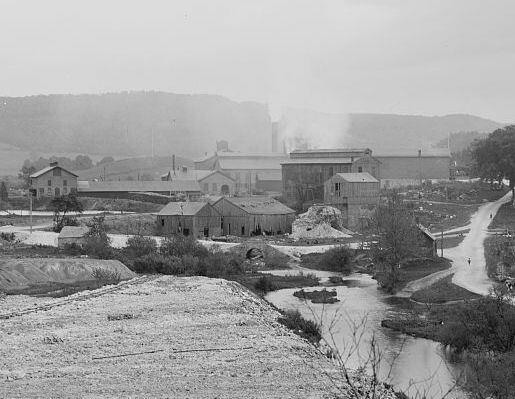 From 1868 to 1880, the New Jersey Zinc Company fought a legal battle with Moses Taylor's Franklin Iron Company, a dispute that was finally resolved in 1880 by merging the two companies into the New Jersey Zinc and Iron Company.Finally in 1897, New Jersey Zinc was able to consolidate the area's mining and smelting operations and begin to build a world-class business. 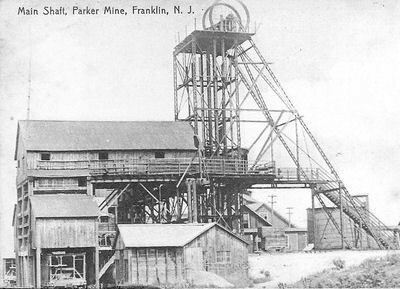 In 1897, the remaining Franklin District companies were consolidated under the umbrella of the New Jersey Zinc Company, led by Stephen S. Palmer. The Palmer family controlled the company for 46 years until the death of Stephen's son Edgar in 1943, when the estate of Edgar Palmer was forced to sell its controlling interest in order to pay inheritance taxes. 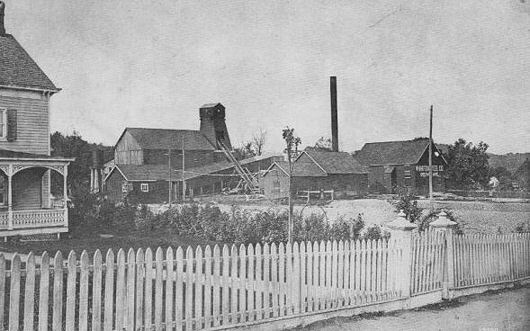 The New Jersey Zinc Company was the largest employer in Sussex County and paid one third of property taxes in Sussex County, providing steady employment for many people. At its peak, the company owned and operated smelters and mines across the U.S. and Canada. 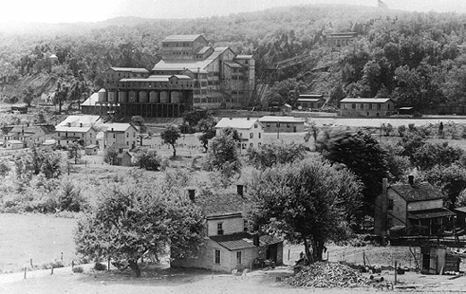 Sterling Hill is one of the oldest mines in the United States and was first worked sometime before 1739, more than 265 years ago. From 1848 to 1896 two surface pits at Sterling Hill were worked for hemimorphite, a valuable zinc ore mineral. 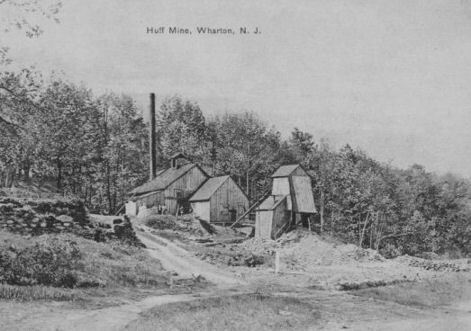 These pits, called the Noble mine and the Passaic mine, remain visible today. The hemimorphite formed during prolonged weathering of the primary zinc ores and formed thick coatings on rock surfaces wherever sufficient open space existed for its formation. During the early 1800s the south end of the Sterling Hill deposit was worked for iron ore. The ore there is dominantly franklinite, a zinc-iron oxide of variable composition. Toward the south end of Sterling Hill the franklinite ran unusually high in iron and correspondingly low in zinc, and thus made a good iron ore. The presence of some manganese in the ore was beneficial because it made the iron recovered by smelting much tougher and less brittle. 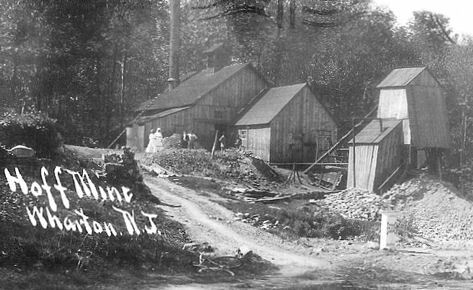 Franklin Furnace is a famous mineral location for rare zinc, iron, manganese minerals in old mines in Franklin, New Jersey, USA. This locale produced more species of minerals (over 300) and more different fluorescent minerals than any other location. The famous mineral association (assemblage) from Franklin includes willemite, zincite and franklinite. During the mid to late 1800s the furnace was the center of a large iron making operation. The Furnace mine which was adjacent to the actual furnace, was a 120+ foot vertical shaft just under Franklin Falls. An early iron mine, the Peters, was most likely opened in 1740 by the Ogden family and operated from 1768 until the end of the Revolutionary War. During this time the mine was worked through shafts and an adit. The mine was reopened in 1807, and again in 1837, when 50,000 tons of ore had already been produced, most if it during colonial times. The mine closed again sometime before 1855. In 1883, an opening was made called the New Peter Mine which was being worked together with a pit which in 1868 was described as being 150 feet long by 50 feet wide. Both openings worked shoots of ore that joined slightly below the surface. In 1884, a new shoot had been discovered but was not worked as the mine temporarily closed. Work recommensed in 1886 and a new shaft was sunk northeast of the old workings. In 1890, the ore was thought to have been depleted and work began in 1891 robbing pillars and stripping the stope walls yielding 20,000 tons. The mine reopened in 1899 operating intermittently thereafter until 1931. During this time, a large amount of work was done. A slope had been sunk 800 feet further down by 1896. 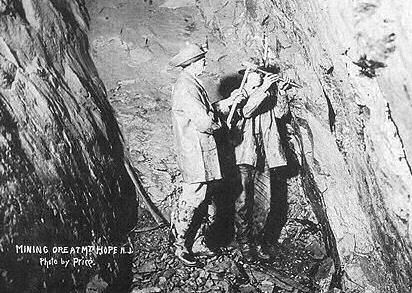 By 1931, the mine had reached a total depth of 3,000 feet and contained 17 levels working multiple shoots of rich magnetite ore containing as much as 68% iron. However, small amounts of hematite were also present. An exploratory tunnel known as the Hope Mountain Drift was driven northeast from level 9 to expose a new shoot of ore. In 1942, the mine was rehabilitated by the government for use during World War II.